The Toyota Corolla hatchback is competing for the hearts and minds of consumers. The Corolla hatchback has an expressive rear end. Toyota hopes what you've got is a recipe for success. The new Corolla Hatch — dare we call it a poor man's Volkswagen GTI — looks a little European from a side view, but the Euro-look breaks down in the back. The rear looks like a "mad-face" emoji. A two tone interior gives the Corolla hatchback an upscale vibe. Toyota's marketing tag line for the Corolla Hatch is, "It's time to switch." And we'd agree that anyone looking for a small cross-over should cross-shop the Toyota Hatch, an all-new design that has its roots in the Corolla iM, which has its roots in the defunct Scion iM. 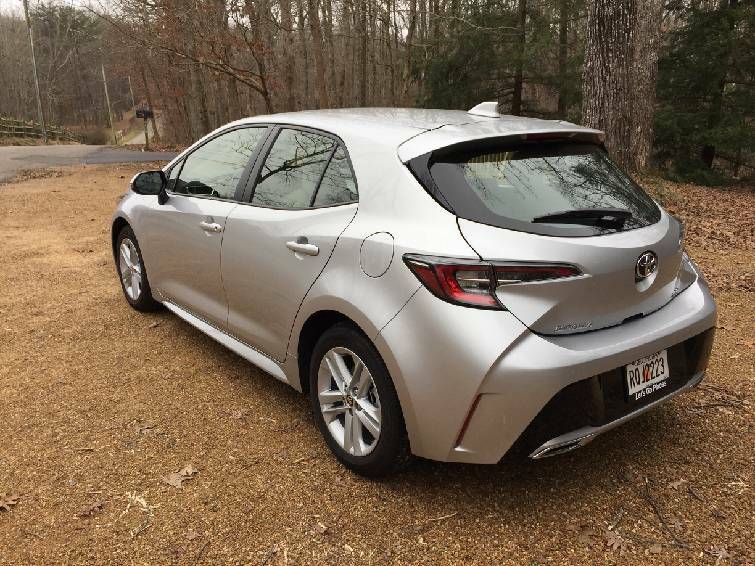 Our 2019 Corolla Hatchback SE was provided for a one-week test drive by the manufacturer. It has the optional six-speed manual transmission, which we found easy to row on our daily commutes from Walden's Ridge to downtown Chattanooga. It even provided a few seconds of exhilaration on Highway 27 on-ramps, until its modest 168-horsepower engine brought the party to a halt. A scan of Chattanooga-area Toyota dealerships turned up only about a half dozen Corollas listed in digital inventories nearby, four at Toyota of Cleveland and two at North Georgia Toyota in Dalton. This may reflect modest demand as well as modest supply. WHAT IS IT? The Corolla Hatchback is a compact car with seating for four — although long-legged passengers will be challenged to get comfortable in the back seats. Trim levels are the SE, starting at $19,990, and the better equipped XSE, starting at $22,990. HOW MUCH DOES IT COST? Our SE tester, with $920 delivery fee, lists for $20,910, and it seems to be a bargain at that price — even before any discounts you might negotiate. 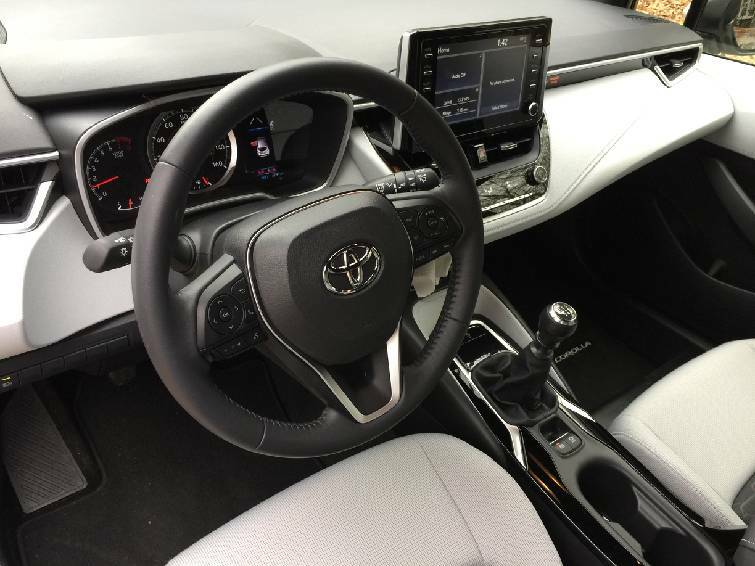 WHAT WE LIKED: A futuristic, two-tone interior design; a big, 8-inch touch-screen positioned at eye level; a compact steering wheel; push-button start and legible guages. ROOM FOR IMPROVEMENT: Our log-book pounted out rubbery shifting at low RPMs; too-tight front seat bolsters; pinched forward visibility and limited rear leg room. DRIVING IMPRESSIONS: If you keep the engine revved, the Corolla Hatch with manual transmission is great fun to drive. Steering is predictable, if a little light, and the car feels tightly-constructed. We'd like to see a performance hybrid version of the Corolla Hatchback, perhaps with the same 219-combined-horsepower gas-electric set up as found in the new RAV4 hybrid. 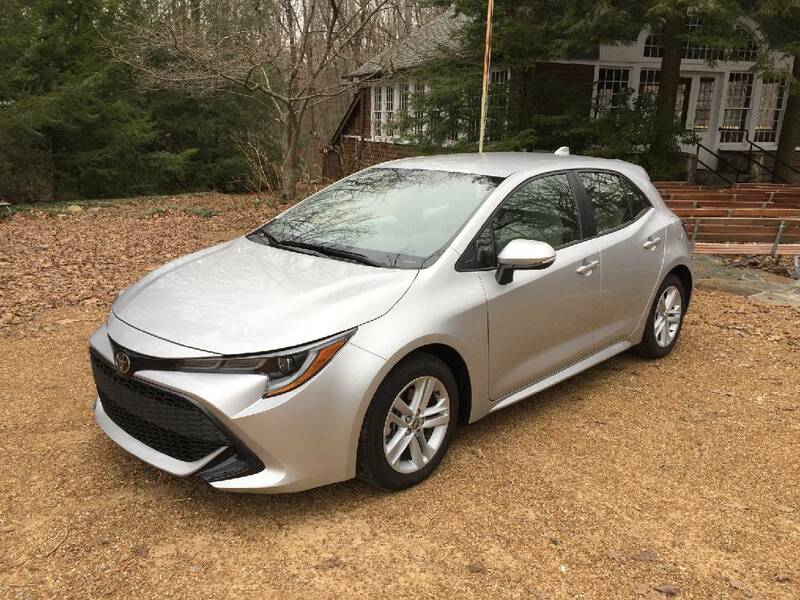 BOTTOM LINE: It the hatchback silhouette releases endorphins in your brain, and the idea of a little Toyota getting 37 mpg highway warms your heart, the Corolla Hatchback is definately worth a test drive.